The Granite Creek Trail connects with the Miller Creek Trail and loop into the A. C. Williams Granite Creek Park, collectively known as the Greenways Trail System. These trail systems are centrally located in the heart of the central Prescott. Lush greenery under a forest canopy lines the trails with an abundance of shade. The Granite Creek trail runs one block west of the infamous Whiskey Row which sides the Courthouse Square. 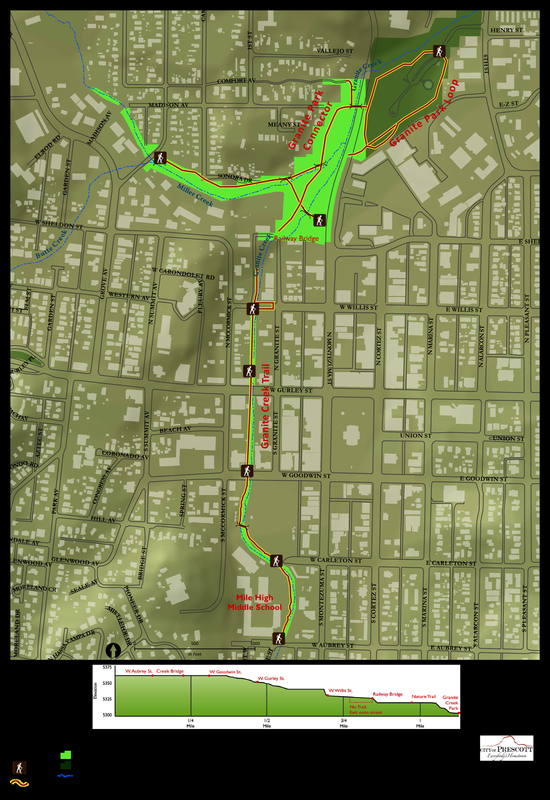 Currently, the Greenways Trail System are about 1.5 miles of multi-use trails running along Granite Creek (north to south); Miller Creek (east to west); which convene and connect northeast to the A.C. Williams Granite Creek Park. The trail system is multi-use and the City of Prescott has plans to connect and extend these trails. City of Prescott overview map of the GTS. The Granite Creek portion extends from Aubrey Street at Mile High Middle School (south entrance) and meanders north to the Granite Creek Park. The Miller Creek portion extends from Grove & Lincoln (west entrance) and connects to the Granite Creek trail which continues northeast under the Laguardia Bridge (Montezuma Street) into Granite Creek Park. 2. Carlton Street just west of Montezuma Street, Mile High Middle School East Entrance. 3. Goodwin Street Bridge, North side of Goodwin, West side of Bridge (El Gato Azul Restaurant stairwell). 5. Willis Street, between Mccormick & Granite Street. 6. Sheldon Street & Montezuma Street. There is a free city parking lot here. 7. Grove & Lincoln Street (NEC). This is the Miller Creek entrance. The most logical entry point for an ideal trailhead would be either the free parking lot (#6) on Montezuma Street or driving into the Granite Creek Park. From Highway 69 West, take the Sheldon Street exit. Follow Sheldon Street until it dead ends at Montezuma Street. At this intersection there is a free city parking lot on the west side of Montezuma Street.